Spiralized Apple Crisp Recipe is a classic dessert made easier with the modern convenience of a spiralizer! 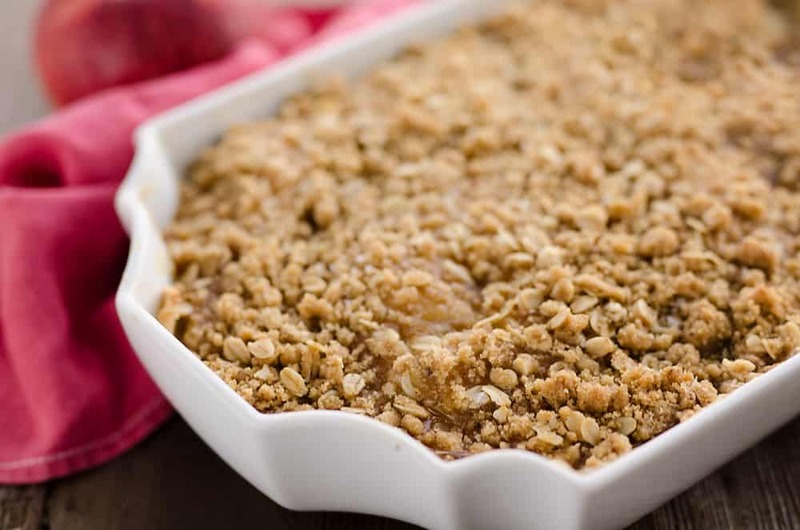 Tart apples are layered between oatmeal and brown sugar for a sweet treat perfect for fall. 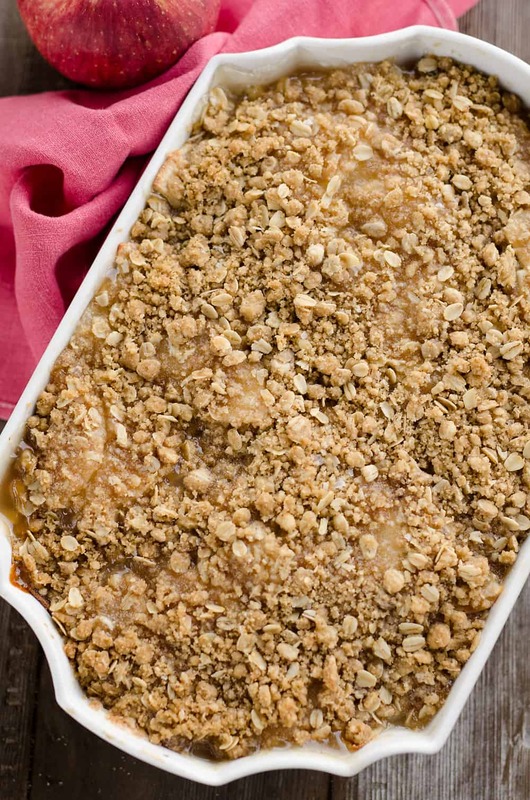 Apple crisp is as American as it comes and the perfect way to enjoy the cool fall weather. With apples in their prime season right now, there isn’t anything quite like a bowl of warm apple crisp with a scoop of vanilla ice cream. It is absolute heaven! I was making dinner for the guys in the field last week and at the last minute decided I should use up some of our apples from our tree for a dessert. 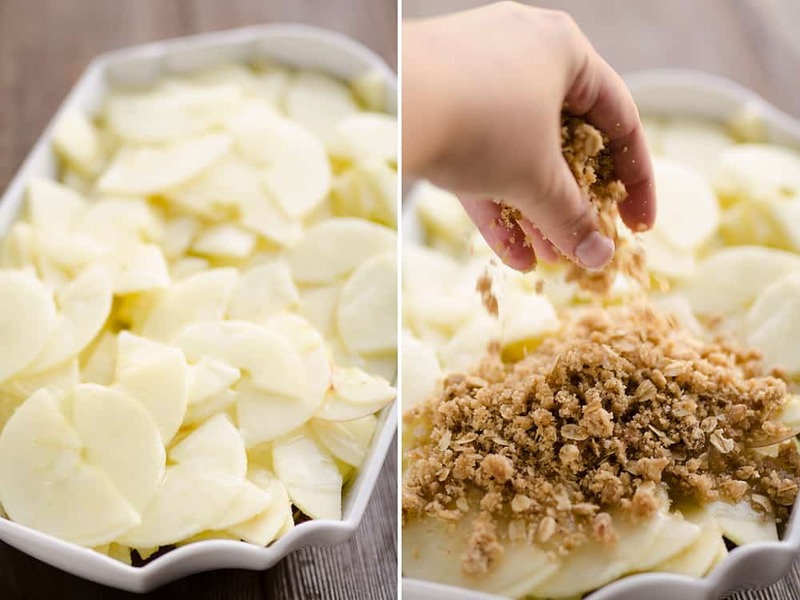 While I could try to be inventive and test out some fun new recipe, I opted to stick to my mom’s recipe with a slight twist on our family’s favorite with this Spiralized Apple Crisp Recipe. Instead of slaving over apples like my mom always does, I made quick work of them by peeling and slicing the apples with my KitchenAid spiralizer attachment. After you attach the spiralizer to your stand mixer along with the thickest slicing blade and peeler, just pop on an apple and let the machine do the rest! It quickly peels, cores and slices your apples in no time. 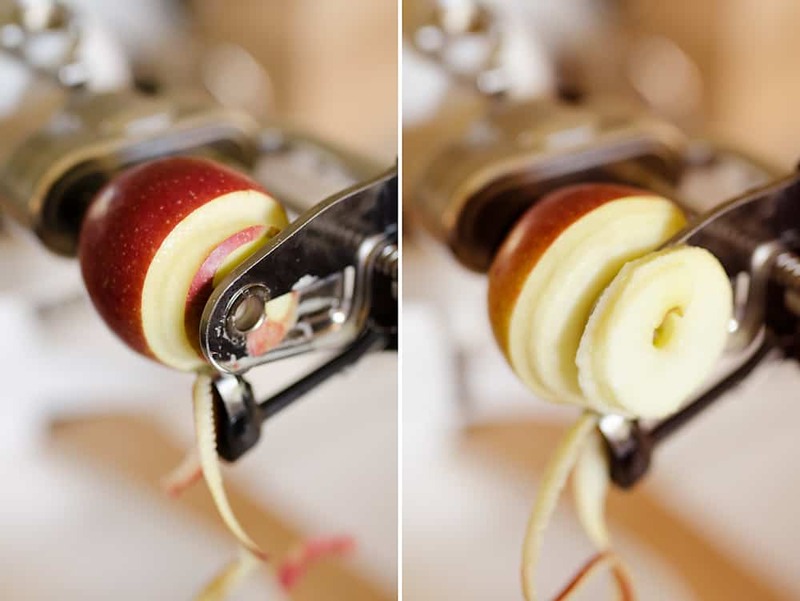 The best part of this attachment is that you can take the peeler on or off as you please, so if you want sliced apples with the skins still on them, that isn’t a problem! 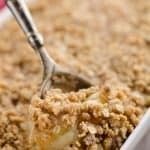 This Spiralized Apple Crisp Recipes takes an hour to bake, but the prep work is a breeze, especially with the ease of the spiralizer. Just mix together some brown sugar, cinnamon, oatmeal, flour and butter and layer half of it on the bottom of a greased 9×13 pan. 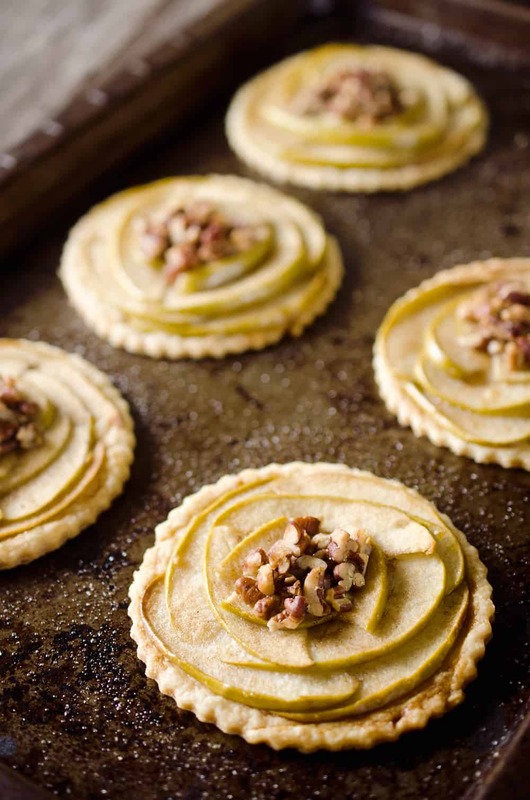 Top the crust with your spiralized apples and a quick mixture of water, cornstarch and vanilla. 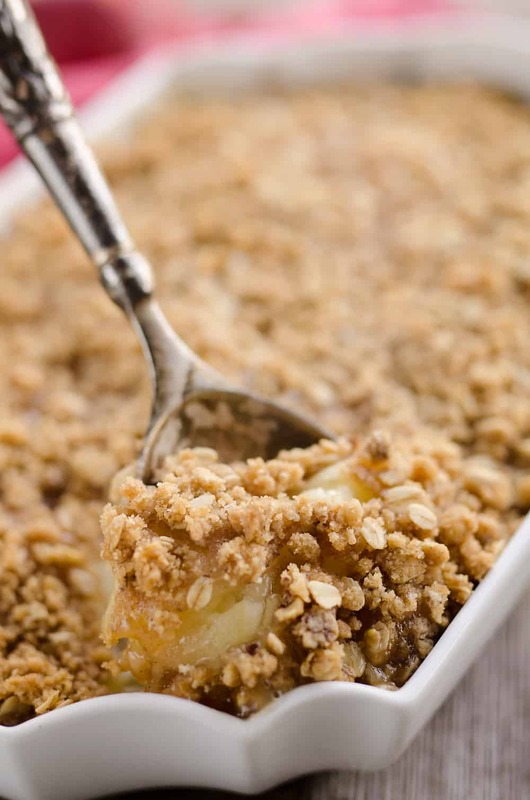 Layer on the remaining oatmeal crumble and pop it in the oven. While the apple crisp was baking, it gave me ample time to whip up dinner for the guys. I opted for this Pressure Cooker Pork Loin, Stuffing & Gravy as it has been my go-to lately. It makes such a moist pork and everything you need to go with it! It is important that you let the apple crisp rest straight out of the oven before serving. If you try to dig right in, it will still be a little runny and sloppy. Giving it an hour to cool allows it to set up nicely with a perfect consistency and still a bit of warmth to melt that scoop of ice cream you serve it with. I am drooling just thinking about it! Mix butter, oats, brown sugar, flour, cinnamon and salt in a medium bowl. Spread half the oat mixture into the bottom of a greased 9x13 pan. In a small saucepan cook the sugar, cornstarch, water and vanilla over medium-high heat for 4-5 minutes or until thick. Top the oat mixture with the sliced apples and pour the cornstarch mixture over the apples. Bake at 350° for 1 hour. Let rest 1 hour before serving. 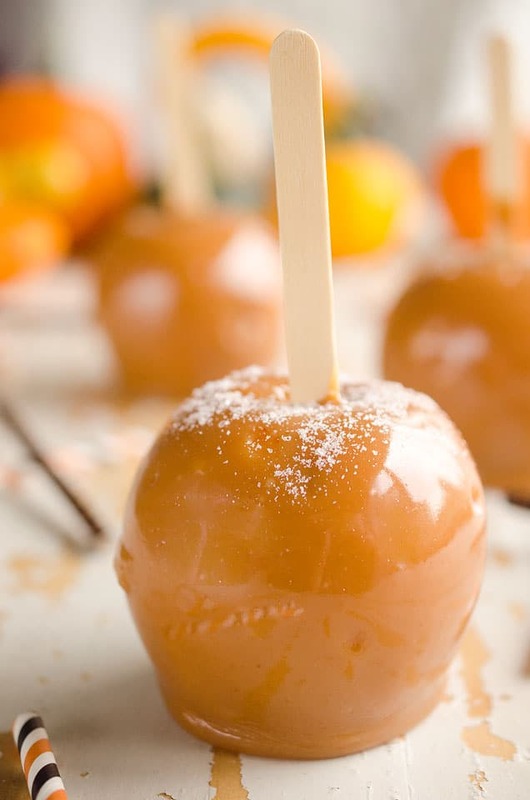 More great apple dessert recipes! I want a big scoop with some ice cream! I can just imagine the wonderful aroma in the home! Yumm. Love the oats in the recipe. There is nothing quite like a nice big bowl of warm apple crisp and ice cream! Mmmmmm! My husband would love it if I made this! And those spiralizers are pretty awesome!